Healthcare needs are changing rapidly with the introduction of new technology and the use of big data. The ability to develop personalised diagnosis and treatment options is becoming a hot topic, in our upcoming sessions our guest speakers will be talking about about how we can take big data and translate this into healthcare options for patients or consumers. Big data is a term coined to describe data sets that are too complex to analyse by traditional analysis software. There are several challenges involved with using big data such as: how you capture the data, data storage, data analysis, searching, sharing, transfer, visualisation, updating, and information privacy. Nic Waddell from Genomiqa will share her story in big data from whole genome sequencing and identifying targeted therapies. Blake Wills from Microba (based at TRI) will be discussing the use of genomic approaches to define microbiome content and how their data is helping to build a clearer picture of the relationships between the microbes present and diseases. Success stories, case studies and personal experiences from health and science industry professionals. The Translational Research Institute was brought together to encourage greater collaboration between science, health and industry. Translation refers to the process of converting scientific research into usable health outcomes for the human population, with education and commercialisation driving results. TRI is home to many success stories including the Vaxxas Nanopatch, patented and commercialised from research completed at The University of Queensland. The distance between core research and influencing a change in clinical practice can sometimes stretch an entire career, but our goal is to provide resources to assist the researches based in our labs to take their research further. Our occupants told us that they wanted to network more with industry professionals, learn about career opportunities complimentary to science and meet successful peers with realistic achievement examples for all career levels. A committee of researchers eager to build their business knowledge has been formed, in conjunction with representatives from our partners Mater Medical Research, The University of Qld, Qld University of Technology and the PA Hospital. Speakers and content have been selected based on feedback from the committee and their peers, and we're always eager to hear suggestions on how we can improve the quality of the series. To launch, 4 sessions have been scheduled so far with the first in October 2017 and the rest rolling out in 2018, each chaired by members of our committee. 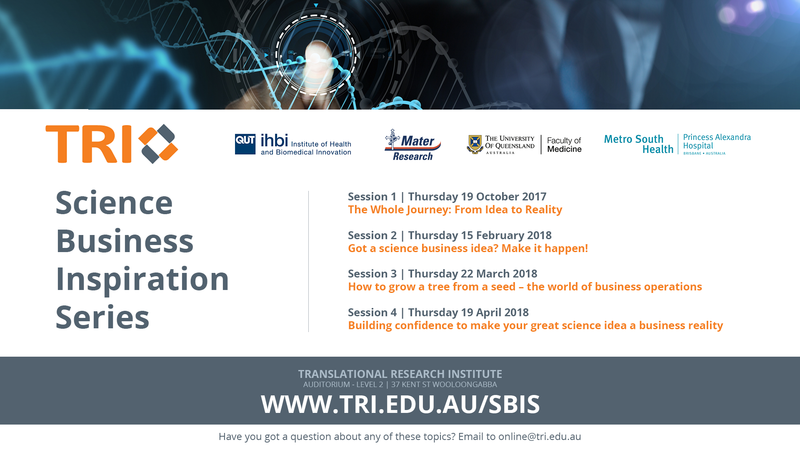 Got a science business idea? Make it happen!